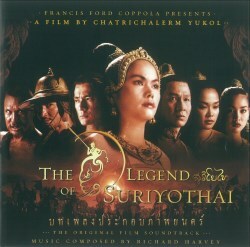 The Legend of Suriyothai is a 2001 Thai film directed by Chatrichalerm Yukol. It portrays the life of a female historical figure, who is also regarded by Thai people as the "great feminist", Queen Suriyothai. A fabled moment in the history of Thailand sets the stage for this lavishly mounted historical epic. In 1528, Thailand's leadership is in chaos, as the Northern and Southern factions of the nation declare their own kings. Taking advantage of the situation, King Tabinshweti, the ruler of nearby Burma, declares his designs upon Thailand and the two countries go to war. As Thailand's independence hangs in the balance, Suriyothai stands as her nation's new champion. She rallies the Thai forces, and, travelling by elephant, leads a brave and determined campaign against the invading Burmese troops. I gave an enthusiastic welcome to Richard Harvey's Plague and the Moonflower (Altus ALU0001: review & review) and then The Great Within (Altus ALU0005). This is another Altus recording of the composer’s music issued by Nimbus. As was the case with The Great Within, without the film to support it, the music has to be judged purely on its own merits. The 17 short tracks are listed below and much of the music is tuneful, atmospheric and attractive. Unless you have seen the film the track titles will mean absolutely nothing. In The Great Within the listener is transported into the world of Chinese music and culture. In The Legend of Suriyothai the composer treads similar ground but this time we are taken to Thailand. Richard Harvey utilises a modern symphony orchestra along with traditional Thai instruments including percussion and bamboo flutes. It’s a thoroughly professional piece of work and an enjoyable 52 minutes. The sound recording is more multi-channel/pop in its approach compared to regular classical recordings but there’s no doubting the impact of this approach. The bass end of the spectrum is boosted and this makes the lower percussion dominate the louder passages in a rather thrilling way. So what does the music actually sound like? Well, Harvey has a knack for writing memorable tunes and lovers of The Lord of the Rings soundtracks will enjoy the disc enormously. The sweeping string tune and glorious horns in A Nation’s Honour could easily have stepped out of one of Howard Shore’s scores. The Gates of Hell also recalls Shore’s Battle of Helms Deep with its horn motif and insistent percussion. Fabulous stuff. The music always has an underlying oriental twist to it and there are plenty of delicate, moving passages such as the touching Eternal Flower. The soundtrack ends with the song Now and Forever and this is in essence the hit theme tune from the movie. I cheekily thought, as I listened to it, that it would probably do well in the Eurovision Song Contest but make of that what you will. I understand that is was a smash hit in Thailand. This is a highly attractive CD souvenir for those who have seen the film but equally recommendable to those who merely enjoy dramatic, tuneful film music. Play it at a high volume and it’s impossible not to be enthralled.